In the Meantime...: preach it. Have you ever though to yourself, "I'm being strong, taking heart, and waiting for you, Lord. Now what do I do in the meantime?" Well...the suggestion I have for you today is testify. There's been a lot of talk around me lately about testifying. I'm not really sure that the Lutheran folks are too familiar with this, but it's been really cool to hear so many people in the last few weeks talk about sharing what God has done in their lives. I heard a guy at my church say the other day, "there's no reason for us not to tell about what God has done in our lives." To that I say, preach it! God is good to us. A pastor who was in Nicaragua while we were said this: "We love the testimony, but we don't love the test." I think that's true. It's sometimes difficult to trust in God's goodness when we're smack in the middle of struggle. However, when we go through trials and come out on the other side, we are witnesses to the fact that God works for the good of those who love Him and have been called according to His purpose (Romans 8). This week I've been reading in Isaiah. He says this in chapter 43. 13 Yes, and from ancient days I am he." We are His witnesses. We're His chosen people whom He loves deeply and He gives us direction to share how He has been Lord in our lives! In Isaiah He's basically saying, "I've loved you and taken care of you so well! When people hear about what I've done for you, they're going to know that the God you worship is real and that God is Me!" If you're waiting for something to happen, look backward for a moment. See what God has done already in your life through the power of Christ. Praise Him for it and tell your story. When Christ lives in us, our lives can't be the same. One of the most powerful ways to share Jesus with people is telling the story of how He has made you His and how He is peeling back the layers to reveal more and more of Himself in you. Preach what's good. Testify about how He's brought you through the bad. Patience comes much easier when you're dwelling on the goodness of what God has done in you and trusting that He will continue to work to your good. That being said...let me preach it for it a minute about what's good with me. 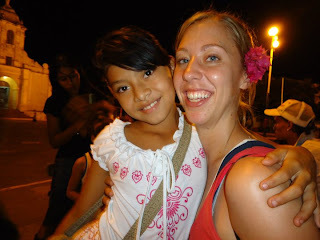 These are two of my best girls from Nicaragua. Kayla and Jazel. 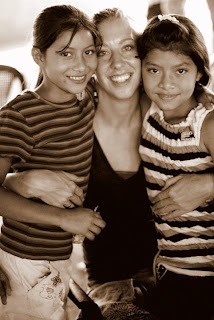 They brought me so much joy and sought me out every time they were at the mission. We danced and sang and it is evident that they love the Lord. They are a part of a dance group at the mission that dances in worship and they dance in parks and other public places as an outreach tool. Though our conversation was limited, they danced their way into my heart. I got to show them love and they did the same in return. I've looked at this picture everyday. I don't know if I'll ever go back to Nicaragua or if I'll ever see Kayla or Jazel again, but I do know that God is using them hugely. And one of the ways He's already used them is to show me the passion He's put in my heart for kids who need to be loved. I don't know how that will look, but God is good and He will provide opportunities to be used both later and in the meantime. You are a blessing in ways you may not even know.